The switch is an electrical device that is used to break or make an electrical circuit manually or automatically. The working principle of switch depends on ON/ OFF mechanism. Various electrical or electronic circuits use switches to control or trigger the owl circuit. The types of switches depend on the connections of the circuit they make. Two essential components such as pole and through can confirm what types of connections a switch can make. These two components are also used to define variations of switch contact. Here, the poles and throws can be defined as; when the number of circuits is controlled by a switch is called poles, whereas throws can be defined as the number of positions that the switch can adopt. A single throw switch consists one pair of contacts like open or close. A double throw switch includes a contact, which can be connected to two other contacts. When the switch is activated, then the current flows through between the two terminals of the switch. When the switch is OFF, then the current doesn’t flow between the two terminals of the switch. The SPST is a basic ON/OFF switch, that is used to connect or break the connection between two terminals. The power supply for the owl circuit is given by this switch. A simple PST switch is shown below. The application of SPST switch is light switch given below and it is also called as a toggle switch. This type of switch has one input and one output. This light switch circuit controls one wire and makes one connection. This is an ON/OFF switch, when the switch in the below circuit is ON or closed, then the current flows through the two terminals and the bulb in the circuit will blink. When the switch is OFF or open, then the current doesn’t flow through the two terminals. The SPDT switch is a three terminal switch, one terminal is used as input and remaining two terminals are used as outputs. It joins a mutual terminal to one or the other of two terminals. In the SPDT switch, instead of other terminals, just use COM terminal. For example, we can use COM & A or COM & B. The application of SPDT switch is mainly involved in a three-way circuit to turn ON/OFF a light from two locations like from the top & bottom of a stairway. In the circuit below, when the switch A is closed, then the current flows through the terminals, but only light A will glow and light B will OFF. When the switch B is closed, then the current flows through the terminals and only light B will glow and light ‘A’ will OFF. Her two circuits will be controlled through one source or one way. The DPST switch consists of two poles that means it includes two identical switches located on side by side. This switch is operated by one single toggle, which means that two discrete circuits are controlled at a time through one push. This switch is used to turn two circuits ON/OFF and it consists of four terminals namely two inputs and two o/ps. The main purpose of this switch is to regulate a 240V appliance, where both supply voltages must be ON whereas the unbiased wire may be always connected. When this switch is ON then the current starts flowing through two circuits and when it is turned OFF then it is turned OFF. This switch is equal to two SPDT switches, it means two separate circuits, connecting two inputs of each circuit to one of two outputs. The switch position controls the number of ways and from the two contacts each contact can be routed. When it is in ON-ON mode or ON-OFF-ON mode they work like two discrete SPDT switches worked by the similar actuator. At a time only two loads can be ON. A DPDT switch can be used in any application that needs an open & closed wiring system. The best example of this is, modeling of the railroad, that makes use of small scaled railways and trains, cars and bridges. The closed permits for the system to be switched at all times, whereas open permits for extra piece to be switched ON or triggered through the relay. From the following circuit, A, B and C connections from one pole of the switch and D, E and F connections from the other pole of the switch. Connections B and E are mutual in each of the poles. If the +Vs enters at connection B & the switch is fixed to the top most position, then the connection A becomes +ve and the motor will rotate in one direction. If the switch is set to the lowest position, the power supply is inverted and connection D becomes +ve then the motor will rotate in the opposite direction. In the middle position, the power supply is not linked to the motor and it does not rotate. This kind of switch is mainly used in several motor controllers where speed of that motor is to be inverted. The main objective of this project is to design a touch controlled load switch. This project uses a 555 timer in monostable mode to drive a relay to turn ON a load for a fixed time duration. The 555 timer IC is activated by a touch plate attached to its trigger pin. The output of 555 delivers high for a fixed time interval as decided by the RC time constant connected to the timer. This output drives a relay which in turn switches ON the load for that duration after which is turned OFF automatically. Human body induced mains supply advances a voltage on the touch plate to activate the timer. This circuit generates a musical tone when somebody touches the touch panel in the circuit, This circuit uses two AA cells and produces plenty sound. 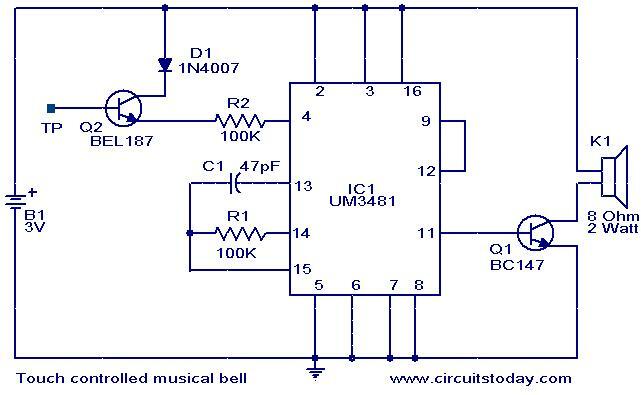 The proposed circuit uses an IC UM3481 which is used in musical circuits. This integrated circuit includes a ROM with 512 musical tones, tone generator, ROM with 512 musical notes, rhythm generator, runoff control, modulator, oscillators, pre-amplifiers and frequency divider. To design this circuit a few of the basic components are required. In this circuit, R1 and C1 works as the timing components for the oscillator. The Q1 transistor is used for driving the loudspeaker. The base terminal of the Q2 transistor is used as the touch panel display to activate the musical bell. Thus, this is all about types of switches and special applications with touch control. We hope that you have got a better understanding of this concept.Furthermore, any queries regarding this topic or applications of touch controlled switch projects please give your feedback by commenting in the comment section below. Here is a question for you, what are the some more applications of touch controlled switch? With reference of book we know that SPST, SPDT, DPST and DPDT are the types of toggle switches. Basically swtiches are divided into three which is (i) manually operated (ii) sensitising switches and (iii) electrically operated switches. Yes, you are right. But there are different types of switches are available in the market like mechanical and electronic. Here we have discussed only some types. Hi,I read your new stuff named “Different Types of Switches with Circuits and Applications” like every week.Your story-telling style is witty, keep it up! And you can look our website about love spells. Not all types of switches you have mentioned right? Excellent post. I was checking constantly this weblog and I’m impressed! Extremely helpful info specifically the ultimate section 🙂 I care for such information a lot. I used to be looking for this certain information for a long time. Thanks and best of luck. Is it through or throw? The first one says single through and the rest are throw.